Unlimited tobogganing fun thanks to the Karkogel cable cars in Abtenau. “Mummy, daddy – can we go again? 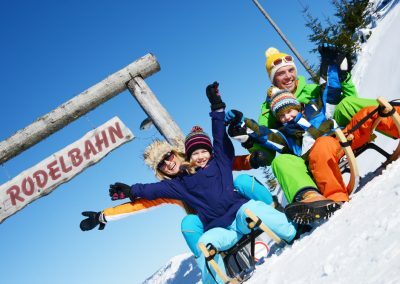 !” You are sure to hear this question from your excited kids while tobogganing at the Karkogel ski resort near Salzburg. Thanks to the affordable evening tickets, your entire family can use the cable cars as many times as you like during the evening! Tobogganing at the Karkogel is easy and fun. 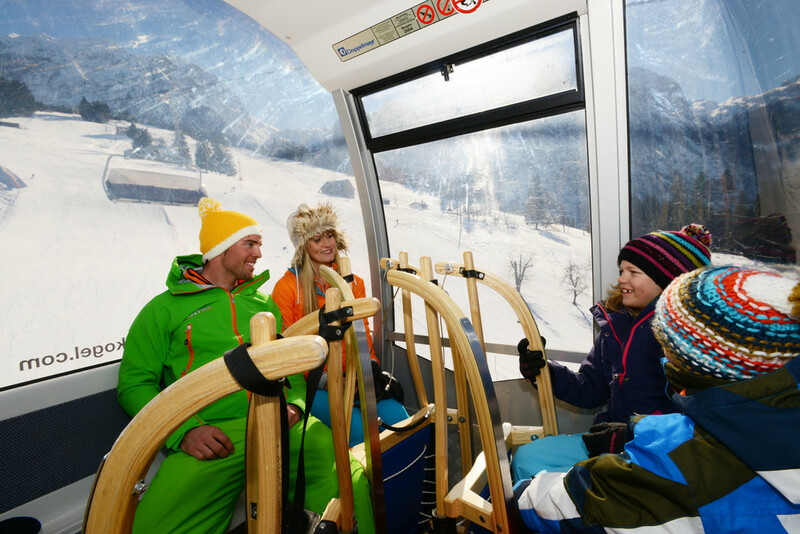 Leave your car at the large car park, hire a toboggan at the cable car valley station and take the cable car up the mountain to the start of the toboggan run – then just hop on your toboggan and go! Evening sledding fun on Tuesday, Friday and Saturday from 06.00 to 09.00 pm. Lighting until 10.30 pm. 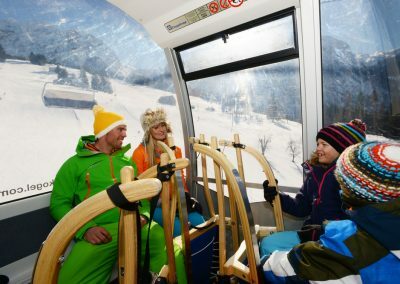 The starting point for 3,000 metres of tobogganing and sledging fun is directly next to the mountain station of the Karkogel cable car. On your mark, get set, go! 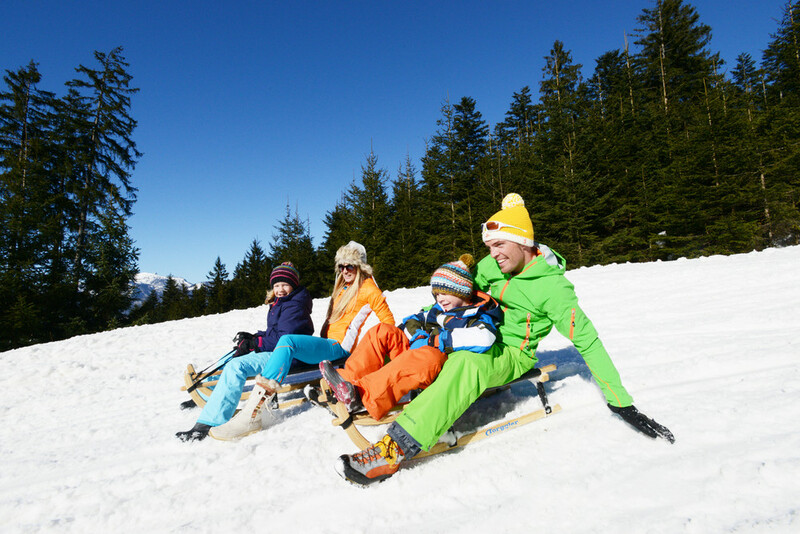 Head down the winding natural toboggan run at the Karkogel ski resort near Salzburg, together with mummy or daddy, or by yourself. Brake, steer and laugh as the snow sprays beneath your sledge and everyone reaches the valley station. Make sure to bring warm ski-appropriate clothes, sturdy winter shoes or boots, and ski goggles as snow spray can hinder your vision while braking and turning. 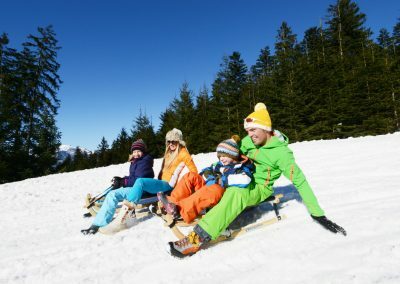 Have a fun evening of tobogganing and sledging at the Karkogel with friends, fellow club members or your employees and clients. Make sure to treat everyone to a stop at the Karkogel ski hut! Everyone will have fun on the toboggan run!